“As someone who did not even dream of coming to the U.S., let alone be a professor here, I appreciate the transformational power of universities, and how they can improve the lives of people all over the world,” Prasad Tadepalli says. Growing up in a small village in India, where his elementary school was taught all in one room, Tadepalli could not conceive that he would become a professor in the U.S. But he feels that his parent’s priority on education is what put him on a trajectory that eventually led to a Ph.D. in computer science from Rutgers University. “I took it for granted that I had to study and do well. My parents expected me to go to college, but they were not expecting me to become a professor here. What my dad wanted me to do was return to my village and become a teacher in the school he worked at as an office manager,” Tadepalli says. He initially came to the U.S. as a software engineer on assignment in New York, but soon found himself craving more intellectual stimulation. He recalls that as a graduate student in India learning about artificial intelligence, the idea of using computers as a way to understand the human mind came as a revelation to him. It was that interest that sparked his desire to pursue a career in research. “I’m fascinated with how people think and how people learn language, and do it so well — even little kids,” he says. Although Tadepalli sees artificial intelligence as way to understand how the human mind works, he is also working towards practical applications in his research. For example, his work on getting computers to learn from texts could lead to improvements in how we interact with computers. “Right now the real bottleneck in communicating with computers is programming. Somebody has to sit down and write detailed instructions of what to do before anything happens. Ideally, we should be able to communicate naturally, rather than through programming languages,” he says. Just as he had hoped when he started his path in academia, Tadepalli finds intellectual stimulation of talking to students and professors about the topics that excite him to be the most rewarding part of his job. And rather than have his students focus on learning facts, he feels it is more important to get them to learn how to think independently. “I design careful exercises that lead them through the thought processes that are involved in solving a problem. I make them work hard, but I think at the end of it they learn more than they otherwise would,” he says. Even Tadepalli’s main hobby involves deep thinking. He typically plays 3 to 4 online correspondence chess games at a time, and volunteers with the school chess club his youngest daughter belongs to. But he also enjoys the chance to get outdoors and hike with both his daughters, and take beach vacations with his family. 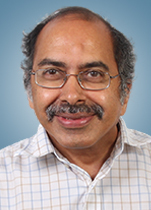 Although his pursuit of academia kept Tadepalli in the U.S. he remains connected to his heritage which he and his wife wanted to pass on to their daughters. His oldest daughter is very interested in Indian music which she plays on violin. They often travel back to India to visit family where his daughters particularly enjoy seeing traditional Indian ceremonies like weddings. And they all enjoy watching Bollywood movies together. Even though he didn’t return to teach in his village, he knows his parents were proud of his accomplishments and the attainment of his dream.